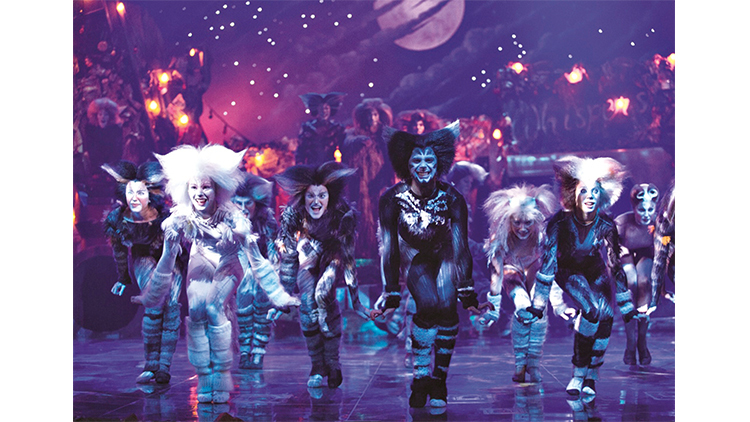 16 Jan 2015: Andrew Lloyd Webber’s feline-themed musical ran for 18 and 21 years on Broadway and in the West End respectively. If the show were a child, it technically reached legal drinking age on both sides of the Atlantic. Based on a collection of cleverly written poems by the great TS Eliot called Old Possum’s Book of Practical Cats, the musical is set on the night of the ‘Jellicle Ball’, where the tribe of cats – known as the Jellicles – assembles and sees which one of them gets chosen to be reborn into a new life. It’s easy to see why it was so critically acclaimed in the 1980s – the staging is imaginative, the songs are fun and, in the age before the internet, it’s an excellent way for people to come together and express their love for cats. But in the 21st century, when our attention span has been shortened to 140 characters and we’re constantly bombarded with fresh information, the three-hour show – which sees little action and doesn’t have much of a plot to speak of – now seems outdated. Indeed, Lloyd Webber has already revamped it and the revival just opened in the West End last month. If you’d like to see the original version, however, this is probably your last chance: we heard that the production that’s currently showing at MasterCard Theatres – a joint venture between BASE Entertainment and Lunchbox Theatrical Productions with Lloyd Webber’s The Really Useful Group – may well be its last world tour. And all in all, this is a pretty good rendition of the classic. The set – a junkyard that oozes a raffish charm thanks to the strings of fairy lights threaded from stage to stalls – is worthy of any stage in London or New York. The costumes and make-up, too, are breathtakingly flamboyant. But of course, this is ultimately about cats, and the cats are great on the whole. This is especially the case for the most famous of them, including the charismatic bad boy Rum Tum Tugger (Earl Gregory), the magical Mr Mistoffelees (Christopher Favaloro) – who performed a brilliant choreography for his song – and Skimbleshanks the Railway Cat (Jarryd Nurden). The star of the show is definitely Grizabella (Erin Cornell), whose performance of ‘Memory’ fully lived up to our high expectations, her voice filling up the entire auditorium with piercing emotions. They are well-matched by the rest of the cast, too. There are some aspects that could be stronger, however. The singing very often gets drowned out by the live band, which is a shame as the poetry of the lyrics is lost to those who are unfamiliar with them; the parts where all the cats sing or talk simultaneously are especially difficult for the audience to catch. Certain scenes could also have been explained more clearly: it’s not immediately obvious, for instance, that the characters onstage were cockroaches and dogs in ‘The Old Gumbie Cat’ and ‘The Awful Battle Of The Pekes And The Pollicles’ respectively. And the appearance of the fearful criminal cat, Macavity, is a bit of an anticlimax, as it took the crowd a while to realise that he made his entrance in the box seats, and his time onstage was brief. Still, it’s worth a watch if you’re a musicals fan – or a cat lover – who has had Cats on your theatrical bucket list for far too long. By the end of the show, you may not ‘understand what happiness is’, as Grizabella sings, but a new show has begun, and you might as well enjoy the memory while you can.